PETALING JAYA: Kuala Lumpur's (KL) office market is expected to remain competitive this year with a substantial amount of over 6.9 million sq ft of office space scheduled to come on stream this year, which will put further pressure on rental rates. Property consultancy, Knight Frank in its Second Half 2011 Real Estate Highlights report said competition for tenants was anticipated to intensify and it would remain a tenants' market. Buildings due for completion this year include Menara Worldwide, Menara Petronas 3 Phase II, Menara Binjai, Menara FELDA, Integra Tower at The Intermark, Menara Darussalam (Grand Hyatt) and The Crest @ Jalan Sultan Ismail. The report said the completions would see an additional 2.8 million sq ft of office space, bringing the projected cumulative supply in the city to 49 million sq ft. In the city's fringe, an estimated 4.2 million sq ft of office space is expected to come on-stream. They include Dua Sentral, Lot A KL Sentral CIMB HQ, Lot E KL Sentral Park, The Horizon Bangsar South (Phase 3), Menara LGB, 348 Sentral and Lot G KL Sentral. 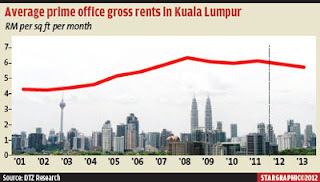 DTZ Research's Property Times Kuala Lumpur Q4 2011 report said the overall office sector forecast pointed to a weakening market as an oversupply was expected due to major completions scheduled in the next two years in the midst of a weakening economy. “By 2014, an additional 13.4 million sq ft of office space will enter the market. Of this, about 11 million sq ft is accounted by 16 buildings located within the city's golden triangle, compared with the previous peak in 1998 which saw a total office space of 4.8 million sq ft,” the report added. Meanwhile, transaction of new office buildings had been fairly active with both local and foreign investors looking around for good buys. Property Times said investment transactions in the last quarter of 2011 saw a jump of 3.6 times in value totalling RM4.8bil against RM1.35bil in the third quarter of last year. This was mainly contributed by the listing of the Pavilion REIT with an asset value of RM3.54bil. It said going forward, given the projected slower economic growth, and a weakening property market across most segments, there would be more caution, and as a result deals would probably become more challenging due to a widening gap between buyers' and sellers' expectations. “With the forthcoming general election expected to be called in early 2012, an element of political uncertainty will arise and may deter investors, especially foreign entities which would like to see a clearer political landscape settling in after the election before embarking on major purchases,” the DTZ report added. The Knight Frank report said although there was a substantial amount of supply coming on stream, it had yet to translate to a decline in occupancy. It pointed out that the leasing market remained active and was driven mainly by the oil and gas and financial sectors. Major leasing transactions such as Weatherford and Transocean took up about 31,000 sq ft each in GTower while Citigroup committed to approximately 100,000 sq ft in Cap Square Office Tower II. The review period also saw Petronas committing to some 30,000 sq ft in Vista Tower while Technip and Shell took up approximately 77,300 sq ft in total in the newly completed Dijaya Plaza. The report said well-located quality and good grade office space with MSC status and green features might command higher rental rates due to limited existing supply of such prime space. “The situation has led to more developers aiming to provide office space with both MSC status and Green Building Index (GBI) accreditation,” it added. PETALING JAYA: Hua Yang Bhd has unveiled plans worth RM80mil in gross development value (GDV), which includes a pedestrian mall and three types of homes at the 838-acre Bandar Universiti Seri Iskandar (BUSI) township in Perak. “We will launch three types of affordable homes, ranging from RM130,000 to RM180,000 for a single-storey to a double-storey linked house,” said Hua Yang Perak branch manager Tony Ng. The Seri Idaman and Seri Andaman series will consist of 909 units of single-storey terrace houses measuring 800 sq ft and priced from RM130,000 onwards. While the double-storey linked houses, named Tropika and Casa series, will be priced from RM180,000 onwards and are due to be completed by the second quarter 2014 and the first quarter 2015 respectively. Developed since 2002, the township is Hua Yang’s biggest township project nationwide. The remaining land bank of 490 acres will generate up to RM 872mil in GDV. “We’ve recorded excellent sales results for BUSI, with 81% of our launches fully sold. This translates to RM56.3mil in GDV based on our nine-month results announcement for financial year 2012. He said the company would be previewing the Pedestrian Mall at its sales launch on March 10, aimed to further enhance the facilities offered at OneBU@Seri Iskandar, the lifestyle and business hub of the township. To date, up to RM800,000 had been invested in upgrading works of BUSI, which included the construction of a new stone wall at the entrance, artistic banner with key wordings of the development, landscaping works, resurfacing of the roads, and increased roads signages. “As for financial year 2013, we aim to launch RM80mil worth of projects at the township,” said chief financial officer May Chan.